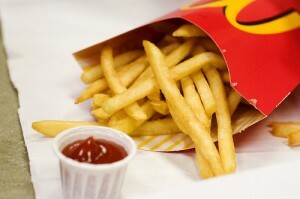 Expressing Palate » Why McDonald’s Fries Taste So Good? You Are Here: Home » Culinary Gibberish, Culinary Information » Why McDonald’s Fries Taste So Good? Why McDonald’s Fries Taste So Good? THE french fry was “almost sacrosanct for me,” Ray Kroc, one of the founders of McDonald’s, wrote in his autobiography, “its preparation a ritual to be followed religiously.” During the chain’s early years french fries were made from scratch every day. Russet Burbank potatoes were peeled, cut into shoestrings, and fried in McDonald’s kitchens. As the chain expanded nationwide, in the mid-1960s, it sought to cut labor costs, reduce the number of suppliers, and ensure that its fries tasted the same at every restaurant. McDonald’s began switching to frozen french fries in 1966 — and few customers noticed the difference. Nevertheless, the change had a profound effect on the nation’s agriculture and diet. A familiar food had been transformed into a highly processed industrial commodity. McDonald’s fries now come from huge manufacturing plants that can peel, slice, cook, and freeze two million pounds of potatoes a day. The rapid expansion of McDonald’s and the popularity of its low-cost, mass-produced fries changed the way Americans eat. In 1960 Americans consumed an average of about eighty-one pounds of fresh potatoes and four pounds of frozen french fries. In 2000 they consumed an average of about fifty pounds of fresh potatoes and thirty pounds of frozen fries. Today McDonald’s is the largest buyer of potatoes in the United States. The taste of McDonald’s french fries played a crucial role in the chain’s success — fries are much more profitable than hamburgers — and was long praised by customers, competitors, and even food critics. James Beard loved McDonald’s fries. Their distinctive taste does not stem from the kind of potatoes that McDonald’s buys, the technology that processes them, or the restaurant equipment that fries them: other chains use Russet Burbanks, buy their french fries from the same large processing companies, and have similar fryers in their restaurant kitchens. The taste of a french fry is largely determined by the cooking oil. For decades McDonald’s cooked its french fries in a mixture of about seven percent cottonseed oil and 93 percent beef tallow. The mixture gave the fries their unique flavor — and more saturated beef fat per ounce than a McDonald’s hamburger.